I made it a little taller this year since I have some taller rose plants. The clear panel top that I made last year fits this configuration. 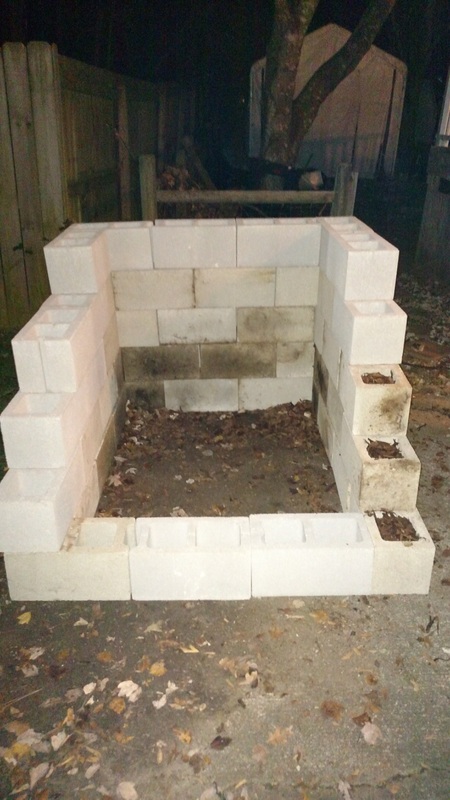 I also chose to fill the blocks with pine bark mulch in an effort to create some insulation within the walls. Inside, I hung a wireless thermometer sensor so I could tell how cold (or warm) it was getting inside the frame. As it was, this past winter was a bit strange. We really didn’t get a lot of really cold periods, compared to prior years. Still, I think it really helped the rose bushes. Drainage: The edge of the driveway next to the grass is a low point and any runoff tends to collect there. Using the blocks means the roses along there are up out of the pool of water. This elevates the bushes so the lawn-care guys can mow and trim around this area without hitting the rose bushes. This also allows me to run a 1/2″ water hose and connected 1/4″ drip irrigation lines between the lines of blocks and it is protected from the equipment of the lawn care folk. 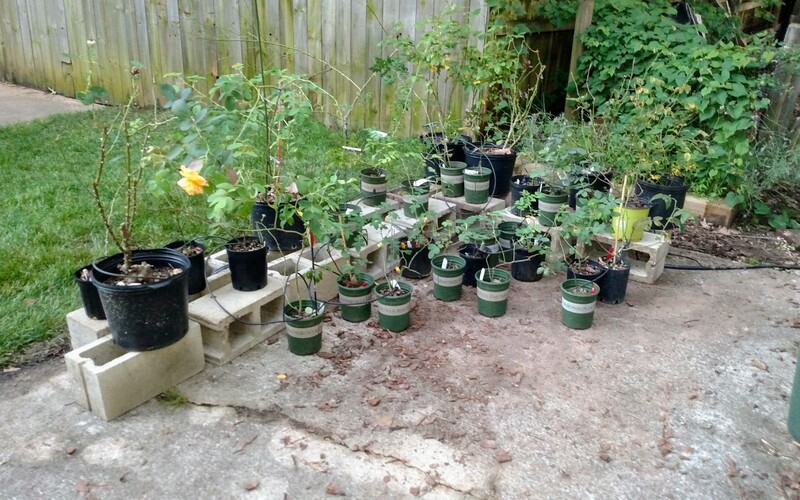 This weekend, I configured the blocks in an “L” shape, layered in the watering hoses, then arranged the 30+ potted roses into the space. Generally I have use the blocks with the holes vertically oriented but I found that the smaller pots were not very stable. 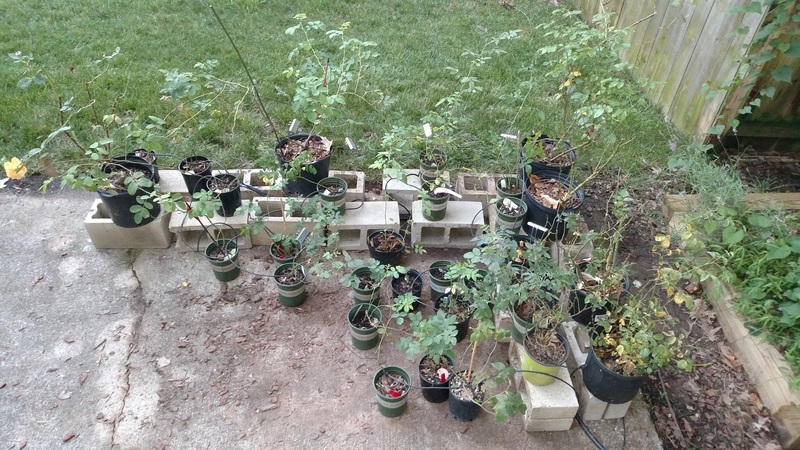 So I put about half of the block on their sides so a solid side would be up… Much better from the smaller pots. Turns out I have more bushes than configure drip emitters so I have to add three inline emitters to existing lines and add three new 1/4″ lines and cover the 8 unconnected pots. I also ordered big box of landscape staples so I can make sure the water emitters stay in the pots. Once I have it all configured, I will set up the water timer (with fresh batteries) on the water spigot and everything on this side of the house will be ready for the coming hot weather!